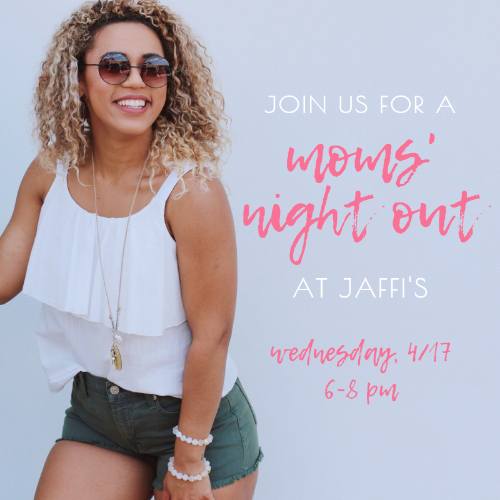 Grab your girlfriends and join us on Wednesday, April 17th from 6-8 p.m. at Jaffi's for a Moms' Night Out. Refresh your wardrobe just in time for Summer with new arrivals from all of your favorite brands! Plus, sip and shop pretty jewelry from Couture Gems and snag a makeover from Carrie Wilson and support PACE Center for Girls. Enjoy complimentary appetizers and beverages and receive 10% off the purchase of full-priced items. Advanced ticket holders ($10 donation to PACE Center for Girls) will receive a fabulous swag bag and the first 5 attendees will receive 50% off one item. All ticket sales and 10% of all purchases made during the event will benefit PACE Center for Girls.